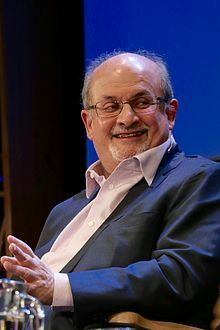 Sir Ahmed Salman Rushdie (Hindi: अहमद सलमान रुशदी (Devanagari), احمد سلمان رشدی‬ (Nastaʿlīq); born 19 Juin 1947) is a Breetish Indie novelist an essayist. His seicont novelle, Midnight's Children (1981), wan the Booker Prize in 1981. Much o his feection is set on the Indian subcontinent. He is said tae combine magical realism wi historical feection; his wirk is concernit wi the mony connexions, disruptions an migrations atween East an Wast. His fowert novelle, The Satanic Verses (1988), wis the centre o a major controversy, provokin protests frae Muslims in several kintras, some violent. Daith threits wur made agains him, includin a fatwā issued bi Ayatollah Ruhollah Khomeini, the Supreme Leader o Iran, on 14 Februar 1989. ↑ Shalimar the Clown by Salman Rushdie. The Independent. Retrieved 2 December 2010. Salman Rushdie the Kashmiri writes from the heart as he describes this dark incandescence. ↑ Tuttle, Kate (14 September 2017). "Salman Rushdie on the opulent realism of his new novel, 'The Golden House'". Los Angeles Times. Retrieved 19 September 2017. This page wis last eeditit on 19 Februar 2018, at 18:31.